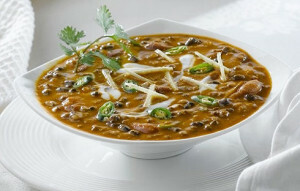 Dal Makhani: Dal makhani is a popular dish originating from the Punjab region of the Indian subcontinent. The primary ingredients in dal makhani are whole black lentil (urad) and red kidney beans (rajma), butter and cream. Dal makhani is also known as maa di dal in Punjab, with its smooth velvety texture and lovely flavor. The traditional preparation of dal makhani involves a series of time-consuming procedures, which can take up to 24 hours to complete. However, with the availability of modern cooking equipment, including electric pressure cookers, the preparation time of the dish has reduced significantly to 2–3 hours. Clean, wash and soak the whole black lentils and red kidney beans overnight. Drain the lentils and pressure cook with 2 cups of water, on medium flame for 7 whistles or till the dals are overcooked. Allow the steam to escape from the pressure cooker, before opening the lid. Whisk till the cooked lentils are almost mashed. Melt butter in a deep pan, on medium heat. Temper the cumin seeds in the melted butter. When the cumin seeds crackle, add the green chillies, cinnamon, cloves, cardamoms, and chopped onions. Sauté till the onions turn golden brown in colour. Add in the ginger-garlic paste, chilli powder, turmeric powder and tomato puree. Cook over a medium flame till the mixture starts leaving oil. Add in the mashed lentils, salt and 2 to 3 tbsp water, if required. Dal Makhani is ready to be served. Serve hot dal makhani, garnished with fresh coriander leaves; with butter naan or tandoori roti or kulcha. If you have any queries regarding the Dal Makhani recipe, please leave a comment.